Multilizer Lite for Documents is an easy-to-use tool for localizing documents in the most common document formats. Multilizer Lite for Documents enables localization of typical text documents, such as HTML (.html, .htm, .php, .asp, etc.) including embedded scripts (JScript for example), XML (.xml, .svg, and all others), and any other text files with regular expressions.Row level commenting, locking, and setting of max width etc. 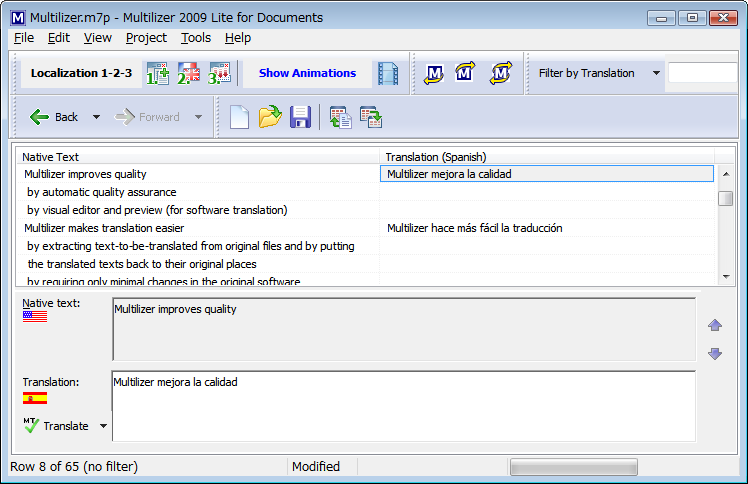 Multilizer Lite is a tool for localizing documents in different file formats. Multilizer Lite projects can be upgraded to Multilizer Pro or Enterprise projects without losing any data. * Row level commenting, locking, and setting of max width etc. Multi-Edit Lite for SAS 2006 a customizable IDE geared for the SAS programmer. Qweas is providing links to Multilizer Lite for Documents 2009_7.2.2 as a courtesy, and makes no representations regarding Multilizer Lite for Documents or any other applications or any information related thereto. Any questions, complaints or claims regarding this application Multilizer Lite for Documents 2009_7.2.2 must be directed to the appropriate software vendor. You may click the publisher link of Multilizer Lite for Documents on the top of this page to get more details about the vendor.